Correction: THE PREVIOUSLY RELEASED ARTICLE MAY HAVE CONFUSED READERS THAT THE INDEPENDENT CONSERVATIVEHQ.COM STRAW POLL BEING CONDUCTED AT CPAC WAS THE OFFICIAL CPAC STRAW POLL. IT IS NOT. CONSERVATIVEHQ.COM IS CONDUCTING ITS OWN INDEPENDENT STRAW POLL AT CPAC. CPAC attendees are rejecting the Republican establishment and its brand of Big Government “me-too-ism” in favor of candidates who are authentic representatives of the grassroots conservative base of the Party. Richard A. Viguerie, Chairman of ConservativeHQ.com today announced the frontrunners in the presidential straw poll independently conducted by ConservativeHQ.com at this year’s Conservative Political Action Conference (CPAC). This is not the official CPAC straw poll. 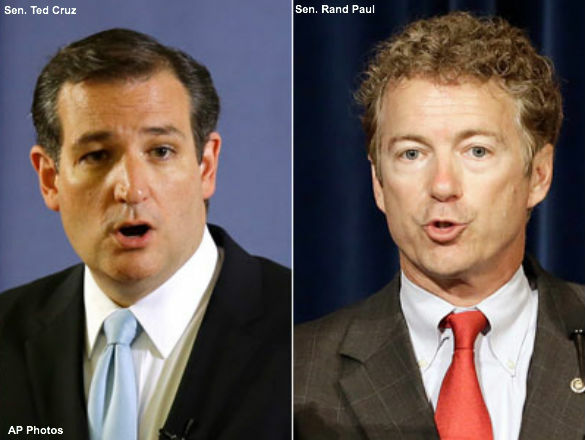 Senator Rand Paul topped the ballot on the first day at 29 percent. Senator Ted Cruz was running second at 17 percent. Rounding out the top five were Ben Carson at 10%, Marco Rubio at 10%, and Chris Christie at 10%. Note: Sarah Palin and Bobby Jindal did not receive enough votes to remain on the leader board. Submitted by david.is.farrar on Mon, 03/10/2014 - 18:25. Neither Sen Cruz, nor Sen Rubio, are Art. II, §I, cl. 4 natural born citizens as 43 out of the last 44 elected Presidents understood that term to mean. The question before us as conservative Republicans is, how serious do you take your pledge to support and abide by the US Constitution? Submitted by jenniges3 on Fri, 03/07/2014 - 12:12. Lets be realistic. The Presidential election is 2 plus years off. Considering past CPAC nominees. How many went on to become the presidential candidate? I like Rand Paul but he gained votes in this poll from a strongly conservative audience. He is elected by his strongly conservative constituents in his district. Can he be elected by the nations voters? I'm not sure of that. Once again I believe the Republican Party and TEA PARTY should focus on a successful conservative governor. Reason being,they are elected by state voters not just district voters. Secondly they have run a state not just an office. That being said; considered it time to concentrate on winning the Senate in 2014 and not be distracted by projecting who will be the RP candidate in 2016. Submitted by hrh32 on Fri, 03/07/2014 - 15:52. He and his pops began their full deal with the GOP in 2012 when Ronnie agreed to be Mitt's wingman in the debates and not lay a glove on him ... in exchange for the GOP elites playing nice with Rand in future. Rand has continued the deal by endorsing McConnell early on. Rand is already bought and sold to the GOP Ruling Class. Rand also has no executive experience. If he wants to run for president someday, run for KY governor when his senatorial term is over. Same for Cruz, except he's in TX, obviously. No legislators/litigators running for the executive position of president, please. Pence = 10 yrs on national/international affairs in the U.S. House and 4 years (by 2016) as governor of IN. These are the types of folks we should be looking to. Yes, I have issues with Kasich and Jindal ideologically. But they have the skillset to govern, so I'll do more research on them if they run for higher office. Rand, Rubio, Cruz, Ryan, Carson do not have the practical skillset or experience for the office. Submitted by rosugill on Sun, 03/09/2014 - 20:31. I like Scott Walker as well. He has proven to be a tough nad principled politician that doesn't back down, and he has done a world of good for the people of Wisconsin, even though that is a union stte and also hostorically a Mafia state. Submitted by HW on Fri, 03/07/2014 - 12:35. A Senator's district is the whole State also.